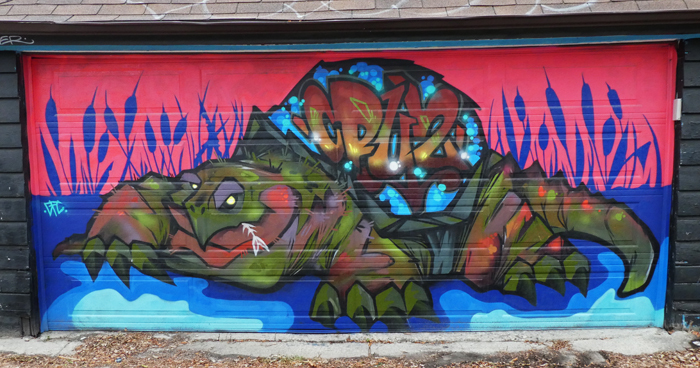 At first glance this turtle painted on a garage door looks a bit fierce but the look on his face and the bit of fish skeleton from his mouth makes him look a bit happy with life. He has just eaten and all is good with the world. The artist for this one is Cruz whose work can be seen all over town. He does look a bit fierce at first but, now I see that smile. Very colorful! Hello, cool looking turtle. He does look fierce. Enjoy your day, have a great new week! That Is Incredible And So Colorful. Thanx For Sharing!! ...this one would be prefect over here on Maui. I love it too! He does look pretty satisfied. Another super garage door. Very creative. Excellent mural on this garage door. Finely drawn turtle. I think he looks pretty awesome. He’s well fed and the sun is shining! No wonder he’s happy! Turtles can look both fearsome and expressive. Cool mural. Will Do Tricks To Eat!